The melodic minor scale is derived from the natural minor scale. To find the melodic minor scale, raise both the sixth and seventh notes of the natural minor scale by one half step when going up the scale, but return to the natural minor when going down the scale. This is a tricky one, so it’s worth reiterating: While you’re going up in pitch when playing a piece, you raise the six and seventh degrees of the natural minor scale, but during parts of the same piece where the pitch goes down, you would play the notes according to the natural minor scale. 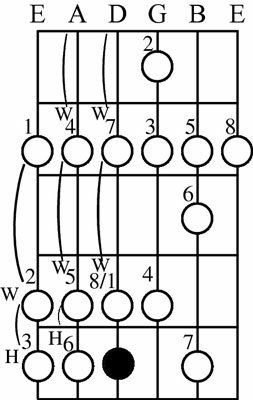 Again, the wonderful thing about the guitar is that you really only have to memorize one pattern for each type of scale and you’re set. To play the ascending melodic minor scale, play the pattern shown here. Note how the pattern changes when you add a half step to the sixth and seventh degrees of the scale. Which key you’re playing in is dictated by the first note of the scale. 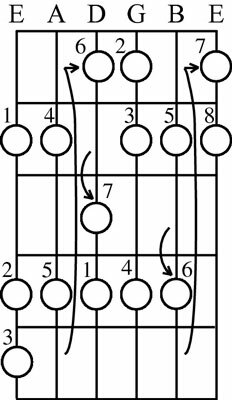 So, to play an A melodic minor scale ascending on the guitar, play the following pattern. The A melodic minor ascending scale. And of course, for the descending notes, you revert to the natural minor scale pattern. 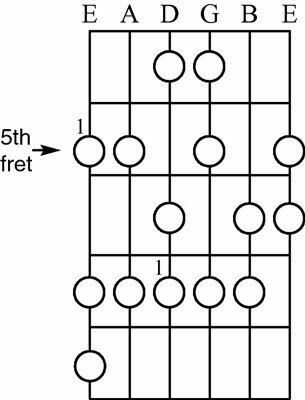 Play this pattern in reverse order for a descending melodic minor scale.